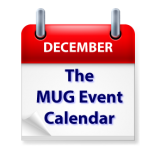 As you might expect, The MUG Event Calendar is quiet this week, with the exception of the Northeast Ohio Apple Core, who will hold a holiday party this Saturday. To the entire Macintosh User Group community and beyond, we wish you the very happiest of holidays. No matter what you celebrate, have a great one!